How to Grow Rhubarb. 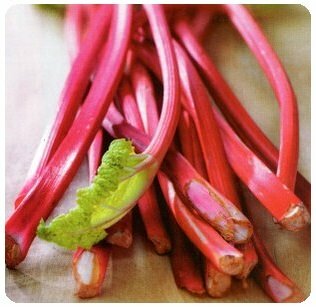 Growing Rhubarb with Tips, Pest & Disease Control. By-the-way, cover leaves with boiling water and let steep for a day or so, dilute 1:10 with water, add a dash of liquid soap and use as a pest spray for other plants. That's all on growing rhubarb. Now for some eating. Tender new stalks can be eaten raw. They can be chopped in fruit salads or soaked in a honey and lemon juice mixture. Stewed for 5-10 minutes in sweetened liquid they can be swirled with cream or custard, and of course are perfect in pies and crumbles. Having a clump of rhubarb in your garden is worth it for the 101 ways to eat and enjoy it... go to it! List of Vegetables — Now you are an expert on growing rhubarb, check out more vegetables to grow.